My first official gardening task of the New Year was to harvest the last of the Brussels Sprouts.Now in my fourth year of growing this tasty vegetable, I can't imagine a gardening season without them. Brussels Sprouts are easy to grow with few issues. The most annoying problem is cabbage worms. It seems ironic that the favorite snack of the cabbage worm is not cabbage,but brussels sprouts. I have used a spray in the past to control this pest. However, this year the infestation did not begin to occur until the end of October. I was able to pick them off by hand until the weather turned cold enough to put an end to their party. Brussels sprouts are in the cabbage family so I treat them about the same. The major difference is that the seeds don't get started until May 1st. After six weeks the seedlings are ready for the garden. As with cabbage I always surround the young seedling with a cutworm collar made from recycled yogurt containers. 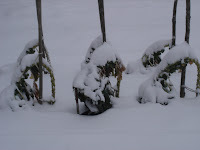 Being a leaf crop brussels sprouts need regular feedingsof a nitrogen rich fertilizer. It is best to stake the plants as they get tall and lanky over the course of the summer.The best time to harvest brussels sprouts is in the late fall and early winter. A hard frost or two takes some of the bitterness out of the vegetable. If picked at just the right size, about one inch in diameter, brussels sprouts can be one of the garden's best treats. When it comes to vegetables fresh is best. In late fall and early winter brussels sprouts are the star of the show. What first attracted me to brussels sprouts was the prospect of extending the harvest season into winter. I take pride in the fact that I was able to go out to my New England garden on a snowy New Year's Day and pick some fresh veggies to enjoy with my family. Brussels sprouts are a versatile ingredient in the kitchen. As I mentioned previously, we serve them at Thanksgiving as a side dish roasted in the oven and tossed with roasted pecans and dried cranberries. Roasting brings out a nutty quality in the sprouts. They pair well with pork in stir fries as well as in a simple saute with olive oil and garlic. We've eaten them raw, shredded in a salad with celery root and bulb fennel. They also freeze well. That's all for now.